A Mexican style luxury hotel located in Playa Paraiso between Puerto Morelos and Tulum, where cultural and sporting activities abound. The hotel's entertainment offering includes a wave pool, lazy river and relaxation pools; sporting activities including an 18-hole golf course and 3 tennis courts, and a variety of dining options that include a buffet restaurant, 8 à la carte restaurants and 17 bars. The ideal destination for discovering the charm of the Mayan Riviera with your family. 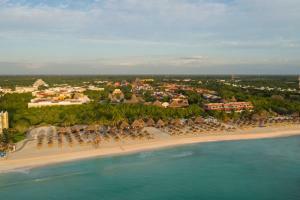 This hotel is located near Playa Paraíso between Puerto Morelos and Tulum. A destination that offers a world of sporting and cultural options just 30 minutes from the airport. Enjoy the impressive culinary offering provided by our buffet restaurants and 8 à la carte restaurants specializing in Brazilian, Japanese or Mediterranean cuisine, among others. Chichen-Itza (3 hours), native towns and the colonial city of Valladolid, Mérida, the pyramid of Chichen Itza (1 hour), Tulum, Playa del Carmen (20 minutes), Xcaret, (40 minutes), and Xel-Ha.